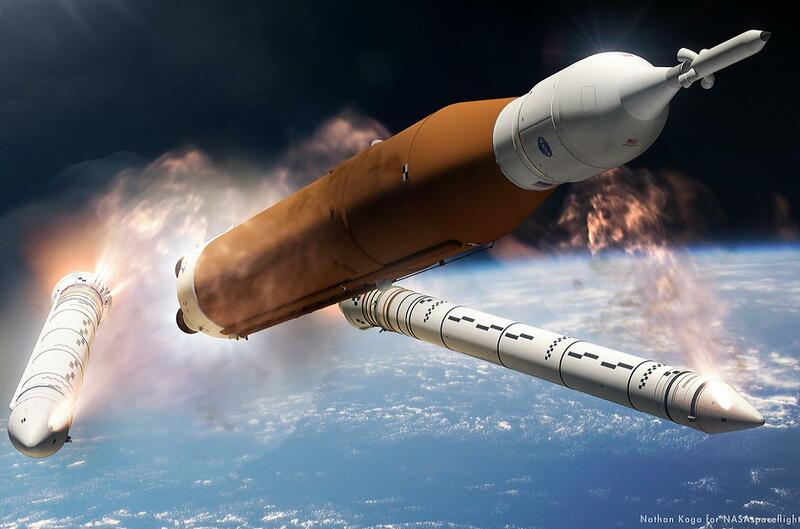 This year’s decision to increase and extend use of the initial “Block 1” operating configuration of NASA’s Space Launch System (SLS) booster also impacts the space agency’s near-term plans for evolution of the launch vehicle’s design. The Congressional commitment to a second Mobile Launcher for SLS, along with the ability of SLS Block 1 to carry out early Orion lunar test flights and send a six-ton spacecraft to Jupiter has engineers back at the proverbial drawing board to look at re-assigned missions and preliminary vehicle configurations. The design and analysis work that comes with the latest change in direction is above and beyond work that was well underway for the second generation SLS vehicle called Block 1B, and the SLS Program is looking at how to juggle schedules to finish all the new Block 1 work so it can fly before Block 1B. Currently forecast to fly in 2020, the first SLS launch will begin Exploration Mission-1 (EM-1), sending NASA’s Orion spacecraft uncrewed to the Moon for a multi-week Lunar orbit mission. SLS will fly EM-1 in its initial Block 1 configuration which has the Interim Cryogenic Propulsion Stage (ICPS), a modified United Launch Alliance (ULA) Delta 4 upper stage, stacked on top of its foundational elements of two five-segment Solid Rocket Boosters (SRB) and a liquid-propellant Core Stage using four RS-25 engines. Already receiving funding, longer-term plans are to develop the Block 1B vehicle which replaces Block 1’s ICPS upper stage with a more capable one called the Exploration Upper Stage (EUS). EUS has four RL-10 engines instead of one in the ICPS, and also has higher capacity liquid hydrogen and liquid oxygen tanks sized to the 8.4-meter/27.6-foot diameter of the SLS Core Stage. Design and development of SLS vehicles is being done in phases or configuration “blocks.” An iterative design process is used by the program to take a vehicle configuration from a preliminary concept to hardware that is certified for flight. “The design analysis cycles are intended to mature the vehicle from pre-PDR (Preliminary Design Review) through CDR (Critical Design Review) and after which you get into your verification analysis cycles (VAC) which feed into your design certification,” Rob Stough, SLS Utilization Manager with SPIE, explained. Graphic from a 2016 NASA presentation showing the different vehicle configuration concepts and the basic plan for progression of development. The Block 1 Cargo configuration (second from left) was dropped in early 2016, but then development was restarted early in the second quarter of 2018. Block 2 is still in a conceptual, study phase. Credit: NASA. Outside of that, other people look at future payload utilization for SLS. “[That] was developed as a way to more quickly with a different set of people and resources look at how can we best utilize the vehicle, how can we look at how the performance can best be used or optimized,” Smith said. “[That] analysis lives more in the conceptual realm that feeds requirement generation that starts the initial DACs,” Stough added. The Block 1 Crew vehicle configuration, which will fly with the Orion crewed spacecraft, is currently into Verification Analysis Cycles. The first mission it will fly is EM-1. “One (DCR) is certification of the configuration called Block 1 and another (FRAC) would be the readiness of a mission called EM-1 using the Block 1, two different flavors,” Smith added. “If you went to Boeing and bought a 737 that would be like a Block 1,” he explained. 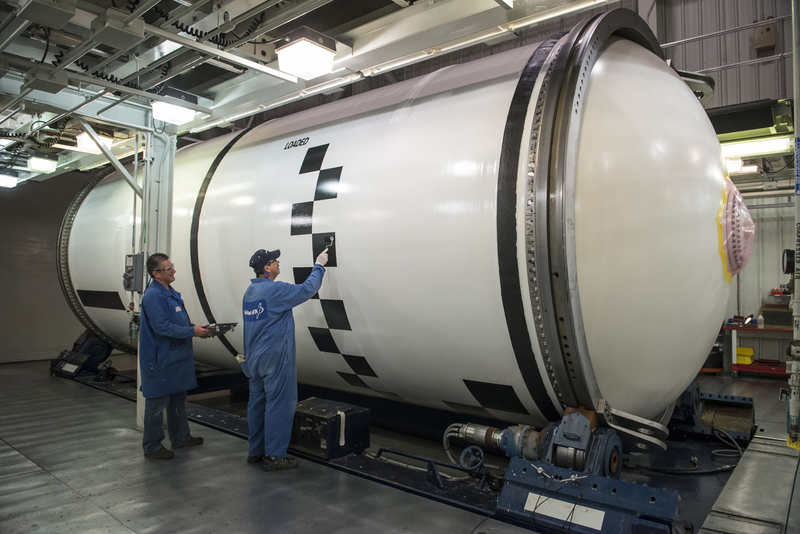 Technicians for Orbital ATK (now Northrop Grumman Innovation Systems) finish painting photogrammetry markings on one of the forward motor segments for the SLS Boosters that will fly on EM-1. The markings are a special customization for the EM-1 flight vehicle. Credit: Northrop Grumman Innovation Systems. 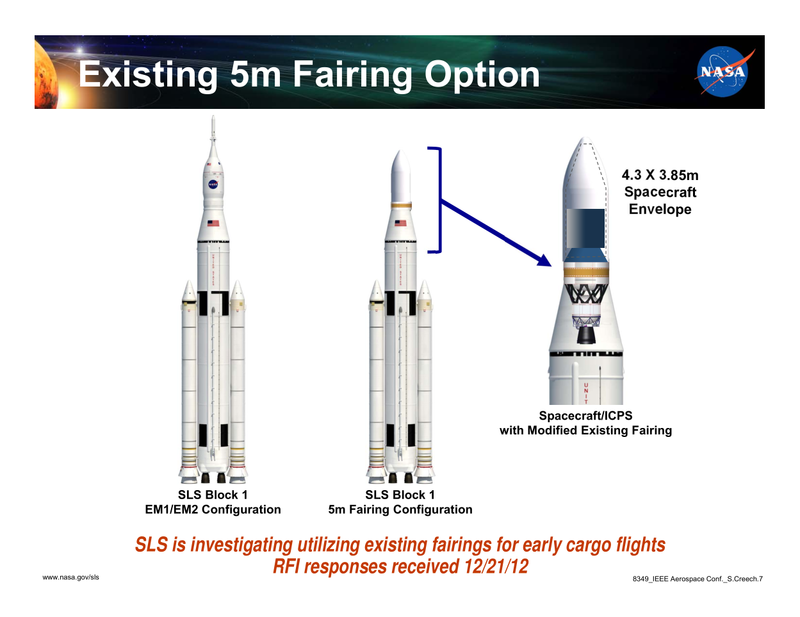 The EM-1 vehicle will have a number of customizations, some because it’s the first SLS flight vehicle. Most visible are the photogrammetry markings on the SRB cases on the +Z side of the vehicle, but a significant amount of one-time Development Flight Instrumentation (DFI) sensors are also being placed on the EM-1 vehicle. Data from pressure transducers, accelerometers, and other types of sensors embedded on the skin of the Core Stage and other parts of the vehicle will be collected during the EM-1 launch and downlinked in real-time along with operational data. 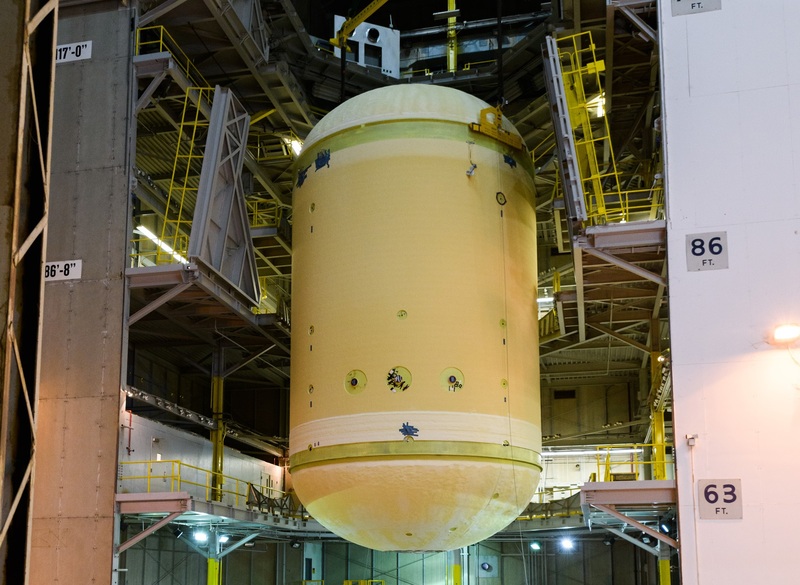 The circular Development Flight Instrumentation (DFI) sensor islands shown on the Core Stage liquid oxygen (LOX) tank for EM-1 are another special customization for the first vehicle. Credit: NASA/Eric Bordelon. FRAC-0 for the EM-1 mission is currently being timed to start after completion of integration of the first Core Stage’s engine section. That critical production milestone for the first vehicle is forecast for somewhere in the first quarter of 2019. Prior to the initial definition of SLS Block 1 in September, 2011, and in all appropriations bills passed by Congress since then, the vehicle was expected to evolve from Block 1 to its required full capability, which continues to be defined as being able to lift 130 metric tons to low Earth orbit (LEO). 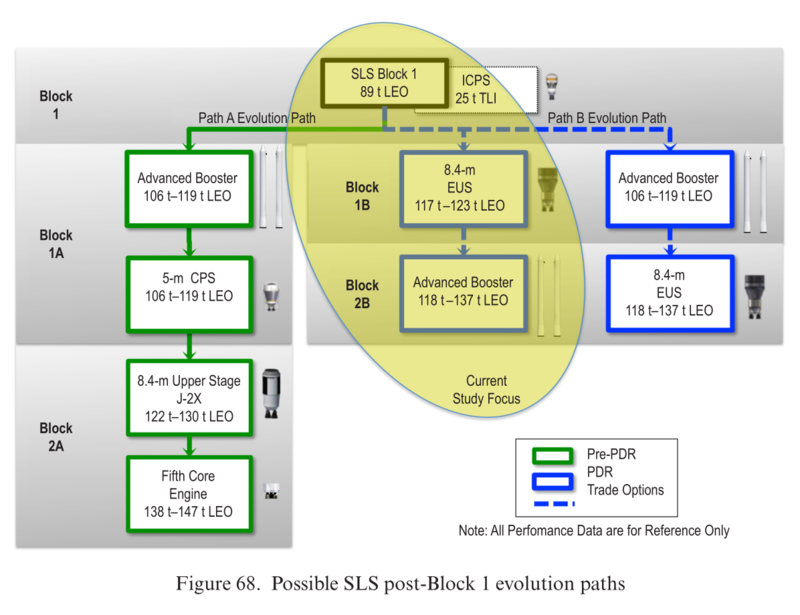 While detailed design analysis on the Block 1 configuration was going on, the SLS Program was also evaluating evolution strategies that would upgrade upper stages and/or boosters. The first evolution, Path A, looked at putting multiple upper stages on top of the Core Stage and Boosters in a Block 1A configuration. 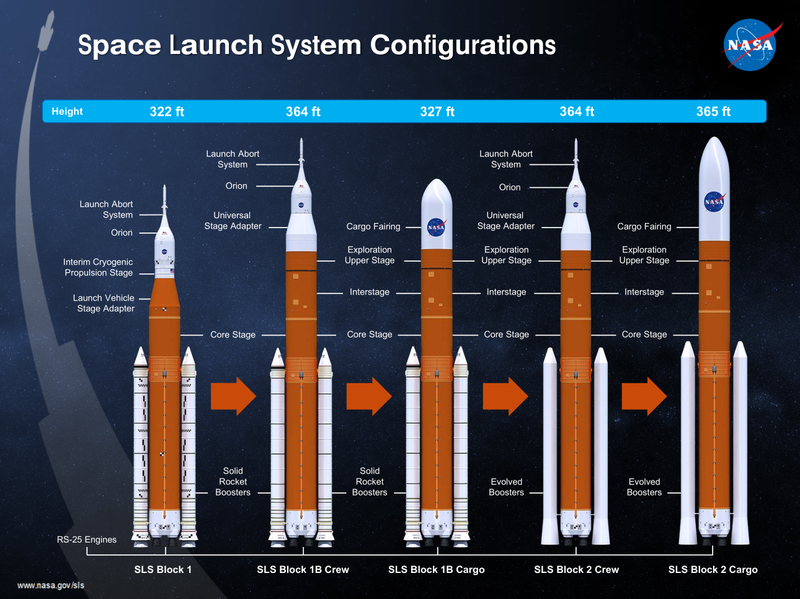 As shown in a graphic from an early 2013 presentation, the Block 1 configuration of SLS was the only one funded for the first five years of the program. Development of the Orion-carrying Block 1 Crew vehicle (left) has progressed through Critical Design Review, while the Block 1 Cargo vehicle (middle) with a 5-meter fairing that matches the ICPS upper stage was largely a subject of studies until this year. Credit: NASA. “So we traded that performance and that development path to all of sudden we came up with a path that said we’ll use four RL-10s and now we’ve got a stage that really does both functions of what the original J-2X upper stage was going to do and its potential third stage CPS.” That second evolution path, Path B, put a single large upper stage on top of the Core and Boosters in a Block 1B configuration. Graphic illustrating the two main evolution paths that were considered from the initial Block 1 configuration. Prior to the Preliminary Design Review (PDR) for Block 1 in 2013, the assumption was that the Advanced Booster concept would be developed first; however, after that both evolution paths focused on starting with upper stage options. Path A/Block 1A looked at developing both a large J-2X-based second stage and a smaller CPS third stage. Path B/Block 1B looked at a single “dual-use” upper stage. Credit: NASA SLS SPIE. The first decision was to choose the evolution path to Block 1B, setting aside the Block 1A possibilities. “When you look at it, as you’re seeing our DAC, VAC, and FRAC cycles that we’re talking about, every time you develop one of these guys you’ve got to do all that over again,” Smith explained. 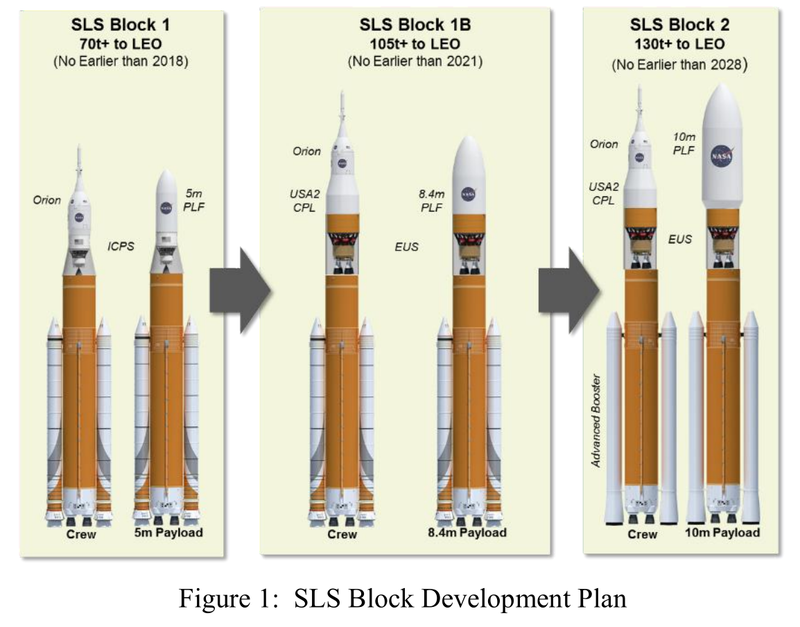 Current public estimates say the Block 1B configuration can place 105 metric tons in LEO; in order to reach the 130 metric ton mandate, SLS has been studying a future evolution of the vehicle called Block 2. 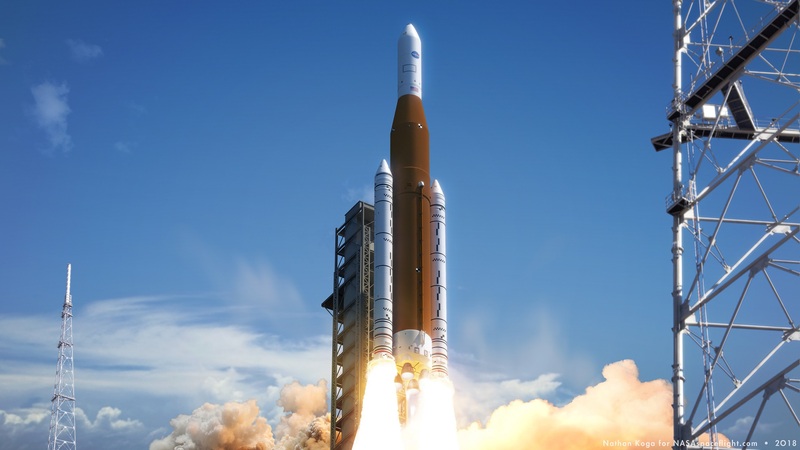 The assumption is that along with improved boosters replacing the Shuttle-derived SRBs, a major redesign of the vehicle would be necessary to get the required performance. Both efforts would be expensive and with Block 1 and Block 1B still yet to fly, development of Block 2 is not currently funded. Although the Block 1B configuration had become favored over Block 1A by 2014 to follow Block 1, NASA still needed to get the authority and funding to begin development. Originally, the Block 1 vehicle was the only configuration authorized and funded and initial launches were studied using ICPS. NASA finally got the go-ahead with the decision by the 114th Congress to develop EUS and the Block 1B vehicle beginning with enactment of the Fiscal Year (FY) 2016 budget in late 2015. Shortly thereafter in late January, 2016 a formal directive was issued by Exploration Systems Development (ESD), which integrates the Exploration Ground Systems, Orion, and SLS Programs, to stop all work on Block 1 after the single EM-1 launch. All subsequent SLS launches would use the EUS and Block 1B. The directive to concentrate on EUS and Block 1B after EM-1 stopped detailed design work on Block 1 concepts, including Europa Clipper studies. With that, not only was ICPS human rating work for EM-2 (the first crewed Orion flight) suspended but studies of launching Europa Clipper on SLS then focused solely on using the more capable Block 1B, which also provided more performance margin for a launch on a direct trajectory to Jupiter. Infographic from early 2018 showing the development baseline established in FY 2016: a single Block 1 launch, followed by all Block 1B launches, and Block 2 continuing to be studied long-term. Credit: NASA. “NASA has always wanted the Block 1B because it’s a great performing vehicle and so when we went to Block 1B formally…all of sudden we started looking at a cargo version of Europa on a Block 1B,” Smith said. At the time, a single Mobile Launcher (ML) was enough to satisfy the long-term goal of one flight per year for SLS and Orion; however, ML was going to require a significant teardown/disassembly and reconstruction to support the longer, EUS-based Block 1B vehicle, along with structural reinforcements to handle the higher weight of both the vehicle and the modified umbilical tower. It was expected that the program’s only Mobile Launcher would be out of service for nearly three years, a 33-month long period that came to be referred to as an “iron-bar” stuck between EM-1 and the next launch that could not be shortened. The desire to shorten the time between initial Orion and SLS flights and the availability of additional top-line funding for NASA led to the decision to fund a second Mobile Launcher in the FY 2018 budget. With funding of the second ML, the first Mobile Launcher, now called Mobile Launcher-1 (ML-1), will remain largely as-is. ML-1 recently completed major construction and after EM-1 it will essentially be ready for additional Block 1 launches. Another formal directive from ESD was issued in late April moving the EM-2 and Europa Clipper missions from Block 1B back to Block 1. In order to launch Europa Clipper on Block 1, an additional SLS vehicle configuration is necessary. Early in the SLS Program before EUS was funded, preliminary studies looked at using a cargo configuration of the Block 1 vehicle. Block 1 Cargo launch from Pad 39B. It is now expected that if Europa Clipper uses SLS, the vehicle flight configuration will use a shorter fairing; the photogrammetry markings on the boosters may also be omitted after EM-1. Credit: Nathan Koga for NSF/L2. After the change in 2016 to go “all EUS,” the SLS Program was developing three vehicle configurations: Block 1 Crew, Block 1B Crew, and Block 1B Cargo. 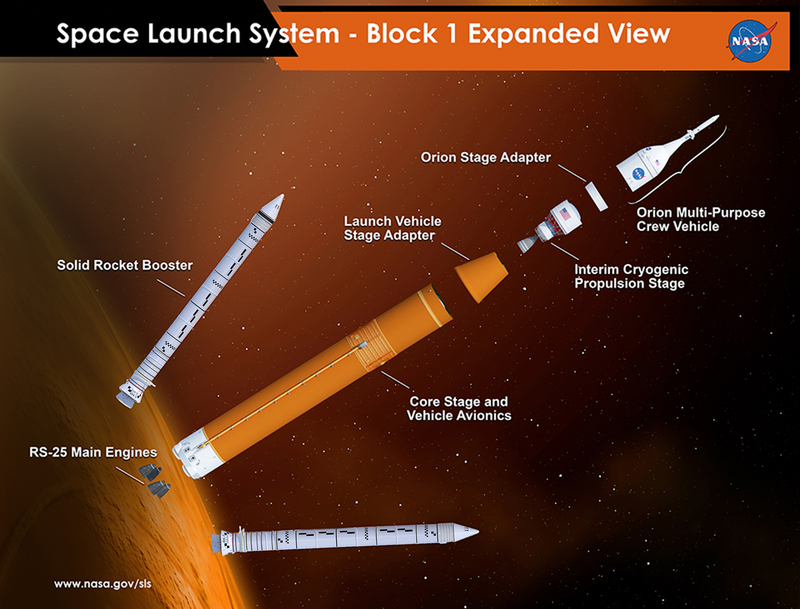 The SLS crew vehicle configurations fly with the Orion spacecraft launch system on top, which includes the Orion, its Launch Abort System, and aerodynamic fairings and adapters. Cargo configurations use an aerodynamic fairing on top of the upper stage to completely cover a payload package during the early phase of launch. With Europa Clipper moved back to Block 1, development work on the Block 1 Cargo configuration has resumed. The ICPS is derived from the Delta Cryogenic Second Stage (DCSS) that is used as a Delta IV upper stage, and NASA has also decided to use the Boeing’s payload fairing system for Delta IV in this configuration for Europa Clipper. EM-2 has also moved back to Block 1 and ICPS, and NASA is planning on leveraging independent development efforts by ULA to human rate the stage. The launch provider is certifying an emergency detection system (EDS) that will fly on the Atlas V launch vehicle for Boeing’s CST-100 Starliner spacecraft. That avionics, along with the move to Common Avionics between ULA’s Atlas and Delta vehicles will help with human rating, since ICPS uses the same Common Avionics. Some additional modifications such as increased Micro-Meteoroid and Orbital Debris (MMOD) protection are also being looked at for crewed Orion missions that fly on ICPS. Development work on EUS and Block 1B is continuing with Smith noting they recently finished the DAC-2 analysis cycle for Block 1B, but all the additional Block 1 work and mission design now has to be completed in front of their first launch. 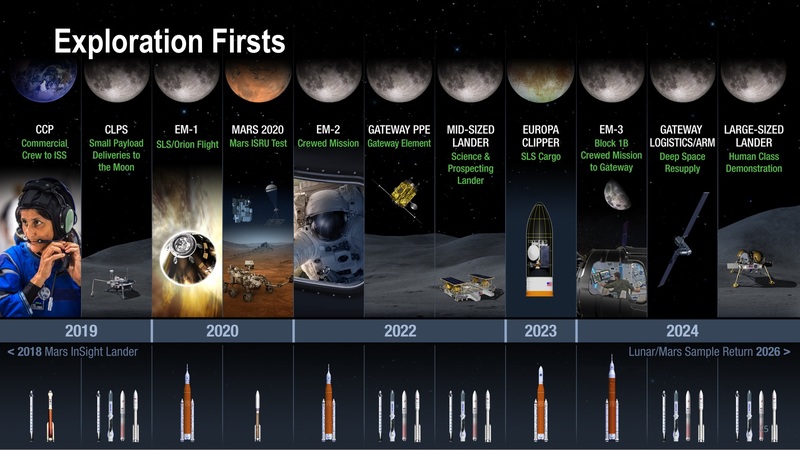 NASA’s the most recent human exploration launch calendar shown in public, including plans to launch four SLS flights: EM-1 in 2020, EM-2 in 2022, Europa Clipper in 2023, and EM-3 in 2024. Credit: NASA. The EUS PDR was completed in early 2017 and prior to the change in plans the CDR was expected some time this year. With all the changes inserted in the manifest, that timing will also change.